For nearly a year my life has been bound up with that of Czech calligrapher and type designer Oldrich Menhart. 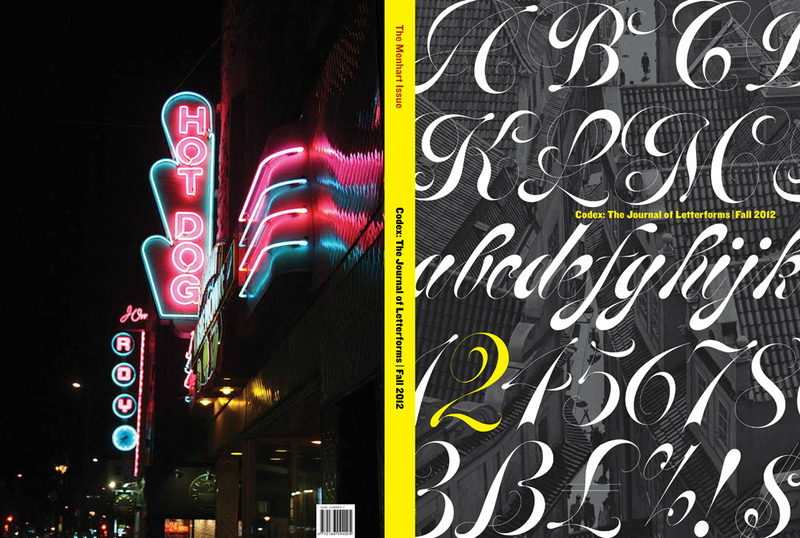 In August 2011 I was approached by John Boardley, the mysterious genius behind I Love Typography, to be the editor of Codex, his new magazine, but it was not until January 2012 that the position was made official. At the time there was no sign of Menhart. It was sometime in March that I concocted the idea to take a short article about him by Veronika Burian and spin it into the in-depth feature that ﬁnally emerged in Codex 2 nine months later. The journey to complete the issue was a bumpy one, due not only to the complicated nature of the Menhart feature, but also to the unexpected (yet necessary) decision to change designers midstream. 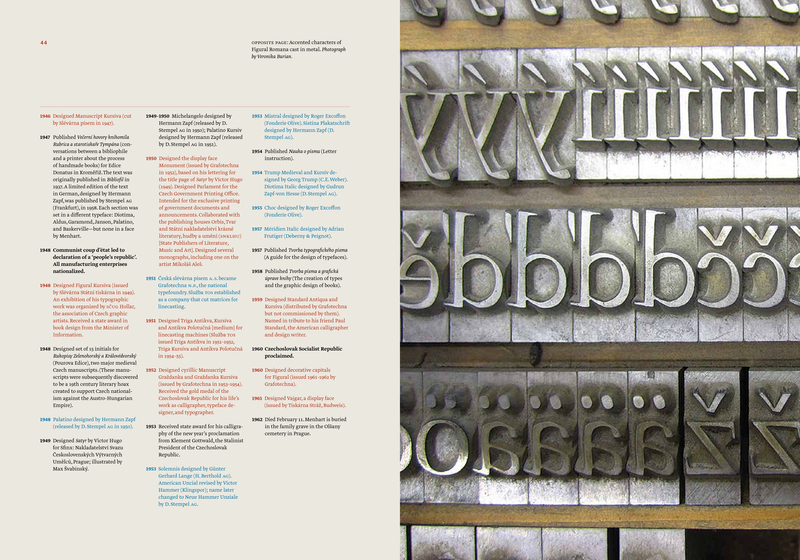 The feature involved acquiring information and material about Menhart’s typefaces from individuals and institutions throughout the United States and in Czechoslovakia, The Netherlands and England, collectors in Prague and The Hague, libraries in New York, Rochester and Chicago, and printers in Maryland and Indiana; and opinions about them from over a dozen contemporary type designers. But if that was not difﬁcult enough, assembling and laying out the material proved even more challenging. This is where Linda Florio, the new designer, proved to be invaluable. Her nearly thirty years of experience designing books and catalogues for art museums and cultural institutions had prepared her for the complexity of Menhart—though dealing with type as art or image (as opposed to the raw material of text) was a new challenge. Codex 2, opening of feature section on Oldrich Menhart, pp. 34–35 with short sheet. Linda acted not only as a designer, dealing with the usual issues of type, imagery and layout, but as a reader—a very astute one. Before jumping into the design of the Menhart section she read the various texts and components more than once and then engaged me in a discussion of his life and career. Her intent was to understand who Menhart was in order to come up with an appropriate visual interpretation of his work. The result was a layout very different from the one I had envisioned several months earlier, a layout that was richer and more complex. 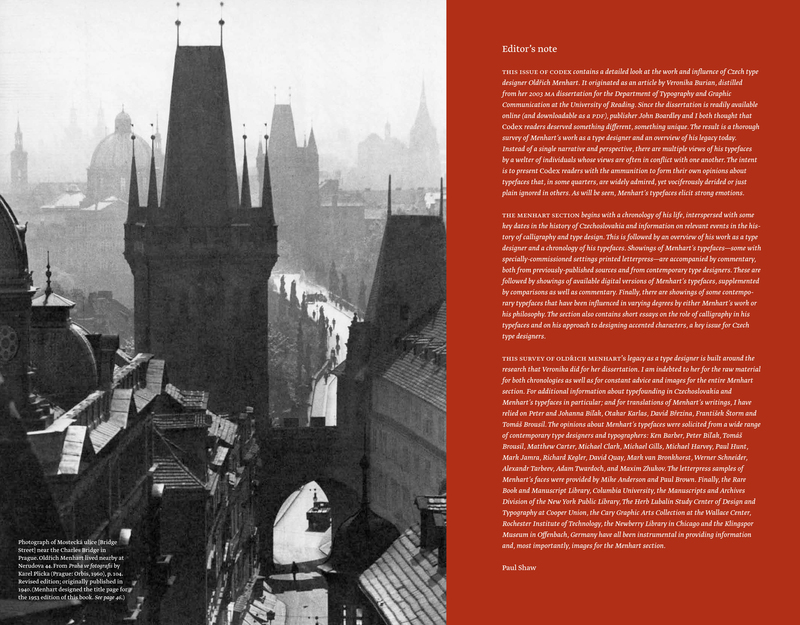 The feature on Oldrich Menhart in Codex 2 is over one hundred pages long; it is the beating heart of the issue. It is the most extensive examination of his career as a type designer ever written and possibly the most incisive. But, Menhart is neither famous today nor someone whose work is easily appreciated. (As the comments from contemporary typographers and type designers, sprinkled throughout the feature, make clear his work is an acquired taste that not everyone enjoys.) Consequently, Codex 2 may be disappointing to some subscribers of the ﬁrst issue. To those of you who fall into this category I urge you to take the time to read the Menhart section, though not necessarily all at once. Dip your typographic toes into it little by little. Try to envision not only the world of type design before the advent of personal computers, but also the world of type design for someone in the midst of some of the most momentous political upheavals of the 20th century. 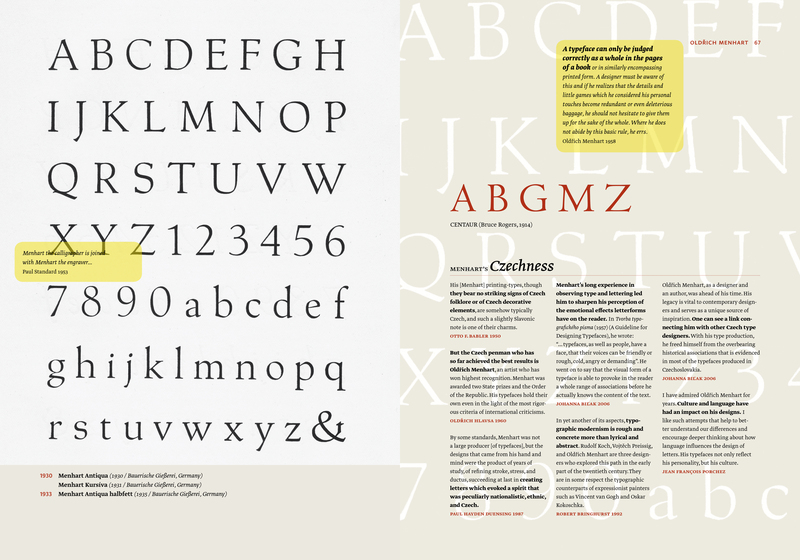 Many of us today consider type to be our passion, the focus of our life. But we are poseurs compared to someone like Menhart. Whether we like his work or not is unimportant. What is important, is that we recognize the extraordinary dedication he had not only to type but to the role that type plays in maintaining a language and an ethnic identity. Like Rudolf Koch, Menhart was a lone typographic genius who forged his own path, sometimes stubbornly opposing the trends of his day but more often ignoring them altogether. One can disagree with Menhart, even violently dislike him and his work—as some do. But one cannot deny that he is a signiﬁcant part of the history of 20th century type design. And thus worthy of the scrutiny that Codex has devoted to him.